Dont know where this question belongs so I'm just posting it here. Is there any thoughts, ambitions or plans to support Force feedback steeringwheels? I'm just wondering, since I love playing racing games with them. We have plans to fully support wheels, it's just not on the priority list right now. Hi Chris, just checking to see when wheel support coming to GRIP? I can wait until final release, but if wheel support ( DFGT ) show up sooner, then be time to take GRIP for a spin again. I'm still busy with Wreckfest, so I not in a big hurry. I read good Steam reviews, so you guys keep up the good work, looking forward to playing final version. PS - Online will have text chat?? I got Bugbear to do a good job with text chat in Wreckfest. Got Bugbear to add text bubble so host know who busy typing a message. Thanks for the post Chris. I can wait for wheel support as long as it there by final release version. Was surprise with this poll over at Bugbear forum that players using pads out number wheel users. Was also surprise there still many KB players on the PC. Pads have become a popular controller on the PC these days. POLL: Gamepad, keyboard or a wheel? Hi Purp, nice to see you bro. I use a progamme called "x360ce" to play the game with my Logitech G27, and its pretty good. Can't tell you how ffb is as I dont really use it. Hi Cornkid. Ya I used your post here about "x360ce" to get my DFGT wheel to work OK with Grip back in March, last year. With Wreckfest, I wanted to be involved with the development of Wreckfest to make sure Bugbear get online right again like they did with Flatout 2. With Grip, I played Rollcage and wanted to see new version get done, but going wait and play the final version ( or maybe beta version ). Don't want get tried of playing Grip before final release. I did give Chris link to my Multiplayer Do's and Don'ts. thread. With Wreckfest, thanks to online and modding custom tracks, have not got tried of early access Wreckfest yet. Hey Purp, when did Wreckfest release a track editor? 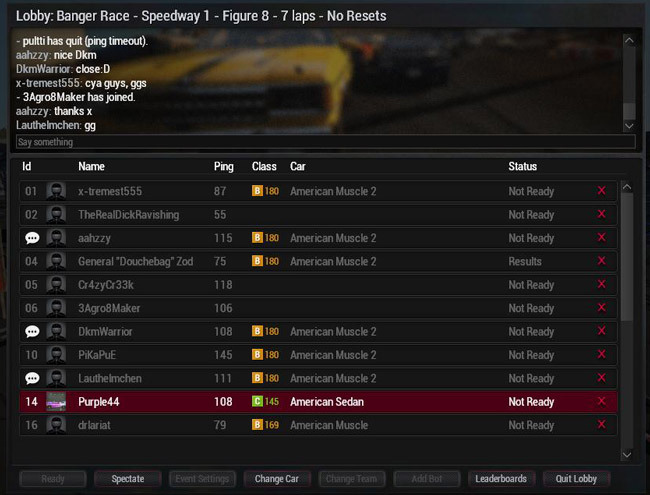 Chris_CE wrote: Hey Purp, when did Wreckfest release a track editor? Modding support breath new life into Wreckfest last year as we been waiting for Bugbear to add more content to Wreckfest. Bugbear going E3 in LA June 13-15 and show off a new Build that going get Wreckfest close to a final version that going get release later this year. Wreckfest use Steam Workshop to make it pretty easy to add mods to your game. I was doing Cops and Robbers mod and Gokart mod by hand, trail and error, but now with the modding tools and using the Stuntfest editor with Wreckfest, have done a suicide track pack and working on a figure 8 track pack, has made making custom tracks easier and less time consuming. Purple44 custom track WIP page. Chris, does the youtube code work in the forum? I tried both ways above and no embed video. What I doing wrong? Thanks for the reply, I've marked this in my notes to look at a bit later. This month is a big content push. Much to do! Have you seen any working embed video in the forum I can take a look at? Good luck with the next big update Chris. I really don't know how any of you can get any sort of control over this game with an Xbox controller, much less a keyboard. Makes me feel completely useless and give up after about five minutes. I did have some success with x360ce a while back but one of the updates broke it and it now longer works. Can you explain how the update broke the x360ce integration? Is there any support for steering wheel? I have loaned from a friend a logitech formula force ex and there is no response from the game. I'm planing to buy "THRUSTMASTER TMX Force Feedback" when I find a sale for around 100 EUR , or something similar in specs for around same price. The main reason I want to buy a wheel is to play GRIP and NFS 2015. Chris_CE wrote: Can you explain how the update broke the x360ce integration? I also tried the x360ce to use with my controller , but when I put the generated dll in the GRIP folder, the game crashes, and the existing dll from GRIP does not work with the pad "Saitek Cyborg Rumble Pad"
Hi Chris, how goes the developing of GRIP these days? Hope things are still moving along. The videos at Steam look good. So any word about wheel support for GRIP?